Alciato at Glasgow: Emblem: Lhierre. Verd par dedans, tout le reste ha palleur. Palles d’estude: en honneur tousjours verdz. cieux & illustres comme l’or. 1. 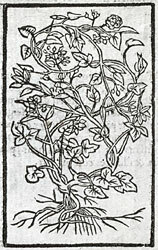 The woodcut here is a fairly close, laterally inverted, copy of that used in the 1549 French edition. 2. For the story of Cissos, beloved of Bacchus, and his transformation into the ivy, see Nonnus, Dionysiaca, 12.188ff. 3. See Pliny, Natural History, 16.62.147: poets use the species with yellow berries for garlands.